The Core SWX Fleet Microcharger provides a rugged and sophisticated charging and remote gear powering system. Camera operators often deplete their batteries faster than they can be recharged. Furthermore, while the ability to quickly assess the charge status of individual batteries is an obvious requirement, monitoring and managing an operations’ overall battery fleet is another way to further production efficiency. Core SWX’s Fleet Micro Chargers offer a complete battery management system, including an on-board LCD to monitor the battery packs’ smart battery data. This data can then be viewed and managed with the charger’s PC-based application. The system provides fast charging, an on-board LCD to monitor smart battery data, a test mode to determine battery health, and the ability to view and manage the data from a PC. 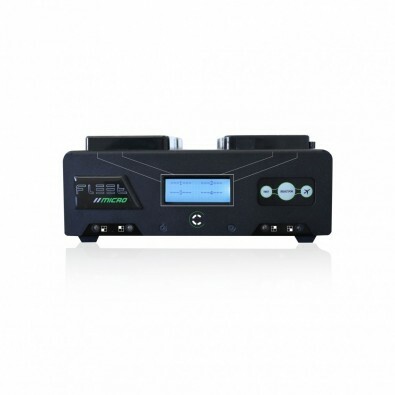 The Fleet Micro Chargers provide the ability to charge at a speed approximately 20 percent faster than other products. This is accomplished by using a larger power supply that can sustain the higher currents needed when charging four batteries at the same time. The chargers attain a charging speed that allows four 98wh packs to be charged in less than 2.5 hours. A production team, in most situations, will have plenty of power to get them through a shoot, with no downtime waiting for batteries to charge. In addition to a rapid charging speed, the charger offers a test mode to determine battery health and recharge performance. Monitoring and managing an operation’s overall battery stock is another way to further efficiency. Evaluating the health of batteries that have gone through months or years of charge/recharge cycles allows for a more efficient use of battery stock. This mode also allows for the extraction of data to a PC and database for archiving and management. The Core SWX Micro charging system offers a complete battery management system. Because of its cross-compatible capabilities, the SWX Micro can automatically charge any brand of professional battery. The charger’s software provides a test diagnosis of a battery’s overall health. The assessment identifies batteries that have the fewest cycles allowing them to be used first. This provides better management of a battery fleet and the maintenance of a balanced set of batteries. Healthier, fresher batteries can be used for high-draw usage while older units can be assigned to lower draw applications. This mode also allows for the extraction of data to a PC and database for archiving and management. Traveling with camera gear is a necessity for those who work on-location. With the ever-changing air safety regulations, it’s difficult to stay current on new guidelines. For example, last year an air safety regulation was put into place requiring that all Li-Ion battery packs must be at or below 30 percent charge when flying. The Fleet Micro’s software includes SafeFly mode to meet IATA regulations for safe air transport. With one touch of the onboard membrane button console, the charger will either charge or discharge the connected packs to an airplane compliant level, depending on the state of charge of those connected. This allows an operation to prepare quickly large numbers of batteries for air travel or shipment. This feature can also be applied to a single connected pack. Simple compatibility with existing and established battery stock is an obvious benefit with a myriad of gear on a given set or on location. One of the most notable features of the Micro Charger is its ability to charge any brand of battery. If an operator puts an Anton/Bauer, PAG, RED or other battery on the charger, it will read it as such and charge it. This additional charge compatibility is especially useful in situations with multiple crews charging legacy packs, and in rental trucks. The series also includes a 90w DC 4-pin XLR power supply to power most cameras. In addition to the on-board power supply, it can double as a battery bank when in the optional “Hypercine” power supply mode (unregulated 12v-16.8v DC). The chargers parallel all on-board battery packs to provide continuous power and the charger’s LCD reports available capacity as well as remaining runtime. The optional “Hypercine” mode provides both unregulated 12v-16.8v 4-pin XLR, as well as 28v regulated 3-pin XLR DC outputs. Each charger model features a mini-USB port that allows users to download free firmware upgrades and the ability to transfer battery information to a PC for data basing. In today’s world, where there is no time to waste, camera operators need an efficient power source for charging their batteries and devices. Core SWX’s Fleet Micro Chargers provide peace of mind to filmmakers looking for a powerful, compact, fast-charging solution.